← Lemon Sorbet and Gray. Cheers to beautiful color! If you have a daughter you probably had or have this type of furniture in her room. 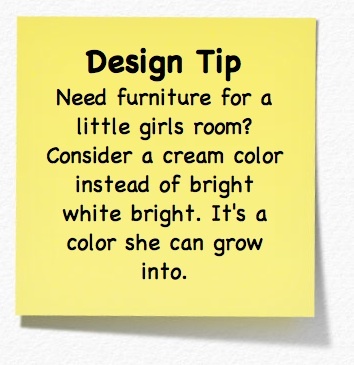 White, off-white or pickled bedroom furniture seems to be the go to color for a little girls room but what happens when she’s not little anymore? Is choosing white furniture a good investment or just the furniture to have until she outgrows white? What are the pros and cons of white bedroom furniture? What are the cons of white bedroom furniture? Well, as you see they just about break even. I bought my daughter cream furniture so it’s not obnoxiously white and babyish. She’s 16 now and has never complained that her furniture is too juvenile plus it looks amazing with her paint color. This entry was posted in Color, Furniture, Kids Bedrooms and tagged behr paint, cream bedroom, girls bedroom, girls room, girls wall color, guava jam, paint color, white furniture. Bookmark the permalink. 11 Responses to White Bedroom Furniture. Timeless or Boring? I agree with everything you just stated. I recently finished my daughter’s room. She will be three in December and currently has an cream colored bedroom set with accents of dark, smokey purple. I painted the bright white furniture in Behr’s ‘Cottage White’ for the very reasons you stated. Of course, I guess one could always repaint the furniture black or dark gray for the teenage/pre-adult years? P.S. 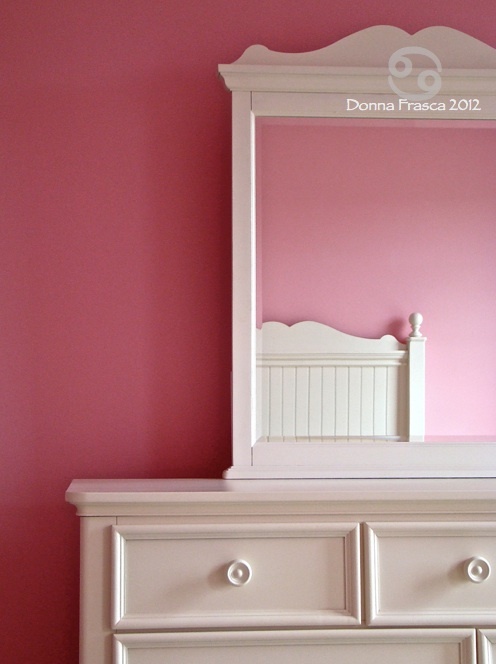 I love the Guava Jam – Great color! BTW… I LOVE the yellow idea. That happens to be my fav color. So true! When my mom redecorated my ‘big girl’ room, I remember only caring about my bedding and the walls. I also had wall-to-wall Kelly green carpeting (obviously 🙂 ) and wanted desperately to change it. Instead, I was told we’d have to keep it. Of course, now green is my favorite color – though I still twinge a bit when I see a very true green rug or carpet! I had some god awful foil wallpaper and poo brown walls in my room. My mom left the house to shopping one day and I ripped the paper down and scribbled on the walls. I somehow convinced her to please let me redecorate my room. The walls were a creamy peach and the carpet … sea foam green! What? It was a good look for the 80’s! I LOVE white bedroom furniture when paired with bright or dark colored walls. I gave my daughter a variation on the bedroom theme I had when I was little. Like me, she had white wicker furniture. Her walls were each a different color as was the ceiling. She had a yellow, a pink, a lavender and a pale green wall. Her ceiling was pale blue. I had some Laura Ashley fabric that were turned into Roman shades and a comforter cover that had all the colors of the room. It was absolutely adorable!